The Netherlands 131-9 (Michael Swart 61, Peter Borren 16, Abdur Razzak 2-23) beat Bangladesh 128 (Tamim Iqbal 50, Mahmudullah 41, Timm van der Gugten 3-18) by one wicket. Bangladesh managed 128 runs before they were bowled out in the allocated 20 overs. The Netherlands achieved the target by smashing 131 runs for the loss of nine wickets on the last ball of the match. The second and final T20 of the two match series was played at Sportpark Westvliet, The Hague, on Thursday, July 26, 2012. Earlier, Mushfiqur Rahim, the skipper of Bangladesh, won the toss and preferred to bat with a vision to post enough runs on board that can be defended. The decision lashed back when they lost the first three wickets for 8 mere runs. The opener, Junaid Siddique and Shakib Al Hasan were gone without opening their accounts as Mushfiqur Rahim scored just two runs. Mahmudullah joined in with the other opener, Tamim Iqbal and they started the consolidation process by getting seven runs in the fifth over. Mahmudullah dispatched 14 runs in the following over of Michael Swart with three consecutive fours. He added another couple of fours in the 9th over and fifty of the innings was completed as well. They kept on scoring at the same pace and enhanced the total to 70 in 11.4 overs when Mahmudullah was caught by Peter Borren off Ahsan Jamil for 41 scored from 31 balls with 6 sixes. Ziaur Rahman came in next, added eight runs in the 14th over with a six and nine runs in the following over with two fours. The hundred of the innings was attained in the 16th over and Ziaur Rahman became the next victim at 106 at his personal contribution of 22 runs. Tamim Iqbal reached his fifty on the second ball of the 19th over but lost his wicket on the very next ball for 50 off 46 deliveries with 1 six and 2 fours. The tail of Bangladesh vanished quickly, they managed 128 and their innings was folded back in 20 overs. Timm van der Gugten was the star performer with three wickets, Michael Swart and Mudassar Bukhari shared two wickets each whereas Tim Gruijters and Ahsan Jamil claimed one wicket each. The innings of the Netherlands was initiated with Wesley Barresi and Michael Swart with caution as they scored just six runs in the first three overs. They added 18 runs in the next two overs with three fours and the first wicket fell at 24 in 5 overs when Barresi was clean bowled by Abdur Razzak for 13 runs. The stumps of Tom Cooper were uprooted by Shakib Al Hasan with the addition of one runs as their skipper, Peter Borren took guards. The duo enhanced the rate of scoring instantly by accumulating nine runs in the 8th over as Borren added 12 runs in the next over with one six and even four. The third wicket contributed 24 runs as Peter Borren was gone for 16 runs. Michael Swart was stranded at one end as the wickets kept on crumbling from the other side at regular intervals. He hammered Shakib Al Hasan for 14 runs in the 17th over, completed his fifty and the hundred of the innings also appeared on board. Swart was finally stumped smartly by Mushfiqur Rahim off Mahmudullah for 61 scored from 49 balls assisted with 2 sixes and 4 fours. The Netherlands required 16 runs to win from the last 12 balls with three wickets in hand and the target was reduced to 10 in 6 deliveries with two wickets left. Abdur Razzak bowled the last over and conceded just two runs in the first three balls, Tim van der Gugten slogged the next ball over mid-off for a six and lost his wicket on the very next ball. Ahsan Jamil hit a four on the last ball behind square leg and won the exciting match for his country. Aabdur Razzak, Shafiul Islam and Shakib Al Hasan were the most successful bowlers with two wickets each whereas Elias Sunny and Mahmudullah held one wicket each. 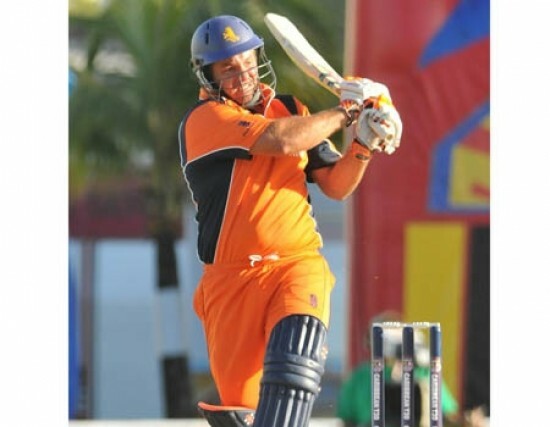 The Netherlands won the crunch match by a margin of one wicket and squared the two match T20 series at 1-1.